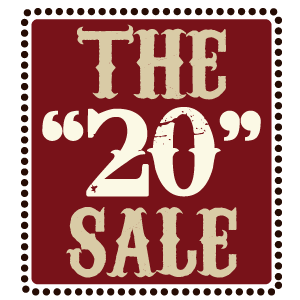 The “20″ sale is a special benefit to members of the Crazy Club who have achieved Mustang Level or higher. For all members of the Crazy Club that are Mustang Level or higher, on the 20th day of every month, starting at the 20th hour (8pm eastern time), for 20 minutes (until 8:20pm), all pounds are $20. The maximum purchase is 20 pounds. To access: enter the website as normal and fill your shopping cart with all the pounds you would like. At checkout, when you login, be sure to click “update” on your cart. You’ll notice the price discount after you click update. Proceed through checkout as normal. So long as checkout is complete before 20:21, you’re set! Free shipping DOES NOT APPLY to this promotion. You will receive a Paypal invoice within 48 hours for any additional shipping which will never be more than $3 per pound. The beef jerky artisans at Crazy Horse Jerky hand-craft the most succulent naturally-smoked gourmet beef jerky in small batches. Our beef jerky is smoked in our own smokehouse using natural fruitwoods for smoke, NOT chemicals or liquid smoke.